The Elephant 6 Collective is a unique force in modern American music, a merry band of collaborators whose psychedelic, Beatles-inspired songs continue to resonate with indie aficionados across the globe. If you aren’t up for seeing more than 10 bands in one place at one time, you should skip the E6 Holiday Surprise extravaganzas, because over their usual three sets in a given night, they will illuminate and educate you, as well as wear down the unready. This gig at the Knitting Factory was night one of three here in New York, and it gave immediate notice to the untutored that life in Elephant 6 land can be a little loopy. This loose-knit group of Athens, GA-based musicians has formed and splintered off into numerous bands, and the sets find the players rotating on and off stage, constituting a different band at each song. This show was a veritable psych-rock circus, with a giant self-playing organ, a trippy cartoon video interlude, a “coming of spring” game that consisted of various audience members trying to pierce a paper target with a tossed fake snowball, a giant snowman, and intense, unusual sounds. The various E6 bands – some of the better-known being Olivia Tremor Control, Circulatory System, and Elf Power, to name a few (oh, and of course, Neutral Milk Hotel whose reclusive frontman could be seen in the audience, but not onstage) – vary in their degree of pop sensibility versus psychedelic experimentation, but even the tamer E6 bands play with sound collages, obscure instruments like the theremin, and a playful, childlike sense of wonder. For three full sets lasting almost three hours, the players treated us with some of the collective’s best-known songs: Olivia Tremor Control’s “Define A Transparent Dream,” Circulatory System’s “Yesterday’s World,” and Elf Power’s “The Well.” But there were more obscure numbers from lesser-known bands like the Gerbils and the late b.p. helium, as well as some new songs as well. It was an evening of the unexpected, a huge range of songs that is difficult to summarize. What was clear was that this collective whole is greater than any individual part. As they closed with a mammoth thirteen-minute version of Sun Ra Arkestra’s “Enlightenment” (most of which was played in the crowd directly under my mics), I couldn’t help but notice that these guys had put on a three-hour set and still seemed to be be having so much fun – and probably had another three hours left in them. As I said, Elephant 6 land is a loopy place. I recorded this set with a four-microphone rig from our usual spot in the venue. Although the band’s engineer was a bit dissatisfied with the house mix, I think he was being a little hard on himself. With some of the room’s natural characteristics removed, the recording is excellent. Enjoy! Special thanks to the Knitting Factory for their hospitality. Also, thanks to Southern Shelter (who recorded the Atlanta show) for their assistance with the setlist. 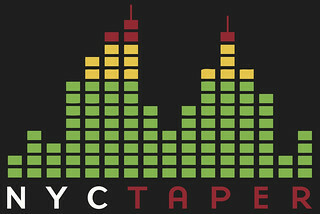 If you download this recording from NYCTaper, we expect that you will PLEASE SUPPORT Elephant 6 Records, visit their website, and support the many fine acts on their label by purchasing official releases (including at the Elephant 6 Store, coming soon). Great recording, amazing show. Thanks!